Status: 13 The data is invalid. This error occurs when the destination Web Server is using Chunked Encoding but it is not passing the correct TransferEnconding header. If possible, the best way to solve it is by asking the web site administrator to change the “TransferEncoding header” parameter on the web server to “chunked”. See How to enable chunked transfer encoding with IIS. If you cannot wait for the website administrator to change this, you can workaround the problem by disabling HTTP Compression for the destination site. On the left hand side, click Configure HTTP Compression under Tasks. To exclude a single IP, add a Computer for the destination IP address you want to exclude. Alternatively, you can create a new Address Range or Computer Set to exclude more than one IP addresses. 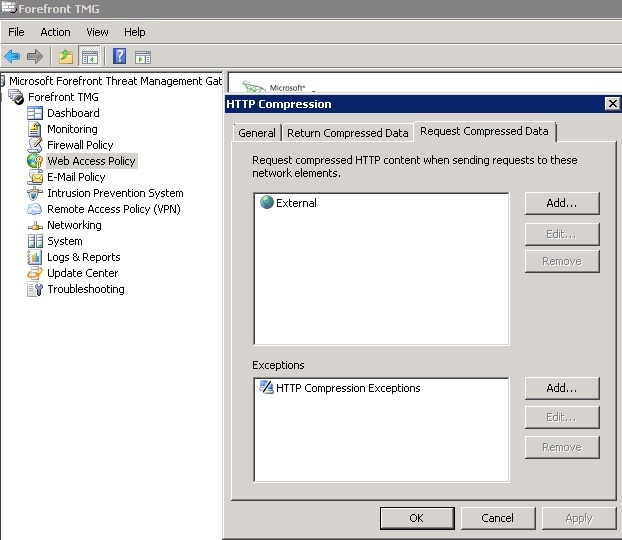 I created a new Computer Set called ‘HTTP Compression Exceptions’ (as in the image above). Click Add to add your new Computer, Computer Set or Range to the exception list. Once the exception has been added, try browsing to the web site again and the issue should be resolved! I hope this post may help you! Great to hear Stephan. Hope everything is going well! This was an issue in our environment with search.yahoo.com. Following a link from the yahoo.com search results resulted in this error. Thanks for the information as this cleared the issue right up! What IP address or addresses did you use for search.yahoo.com? I have added two IP’s associated with search.yahoo.com, but the problem still exists. search.yahoo.com currently resolves to 98.137.250.95 for me. Perhaps run a live log query in TMG’s management console (Logs and Reports view) to see the IP associated with search.yahoo.com (use a filter such as URL contains search.yahoo.com). I hope this helps! Thank you, solve my problem here.